Smiley Balloon - Gifts - Balloons - Perth Florist Perth in Western Australia specializing in flower delivery of roses and wild flowers. 45cm foil Helium filled balloons are ONLY available as an accompaniment to floral & gift presentations. 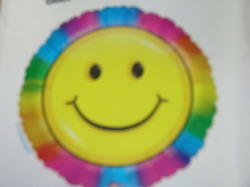 Smiley face balloons come in several styles. They make a great addition to brighten any occasion, and can be used in a bunch with other foil balloons.